1855 Kellogg $50, graded PF-63. Two NGC-certified California gold “slugs” from the 1850s are bringing excitement to Heritage Auctions’ U.S. Coins Signature Auction in Chicago on October 11. An 1855 Kellogg $50, graded PF-63, is among the finest-graded of the 12-15 known survivors of an original mintage thought to number about two dozen. 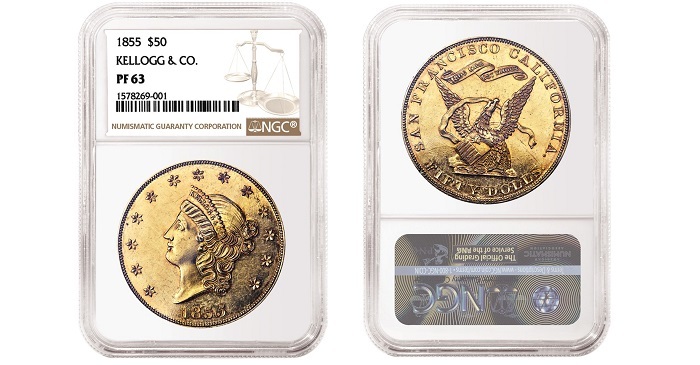 Kellogg & Co. produced $20 gold “slugs” in 1854 and 1855 as the new San Francisco Branch Mint was still gaining its footing. It is unlikely the Kellogg $50 pieces were created for circulation, but rather to prove the company could produce the same kind of pieces a competitor was minting. 1851 Humbert 887 with “50” $50. Hover to zoom. 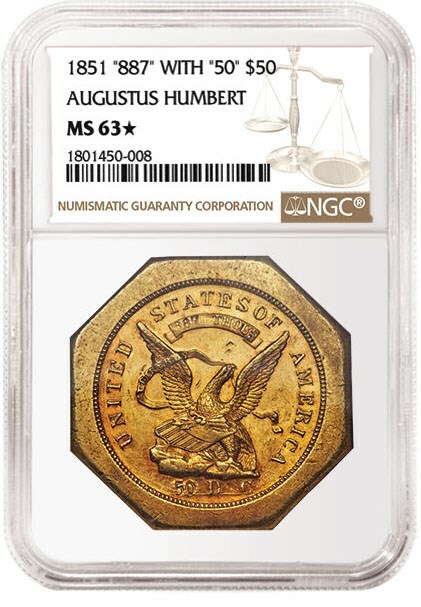 Meanwhile, another Gold Rush era rarity, an 1851 Humbert 887 With “50” $50, graded MS-63, is the finest-known example of this particular version of the octagonal ingots produced by U.S. Assayer Augustus Humbert just a few years earlier. Lot 3196: An 1854 Large Date $20, graded MS-64.